For your favorite All-Star this gift basket is perfect for Birthdays, Get Well Wishes and Retirement gifts for men. Crossword puzzle book for brain building fun. Sudoku puzzle book and mix of math and problem solving puzzle fun. Circle a word puzzle book try to find the words hidden on the page. Famous Amos Chocolate chip cookies single serve bag. Snyders Pretzels 100 calorie bag. Smartfoods white cheddar popcorn 1 oz. bag. Cup of soup chicken noodle flavor just add hot water. Crackers and cheese to go with the soup. 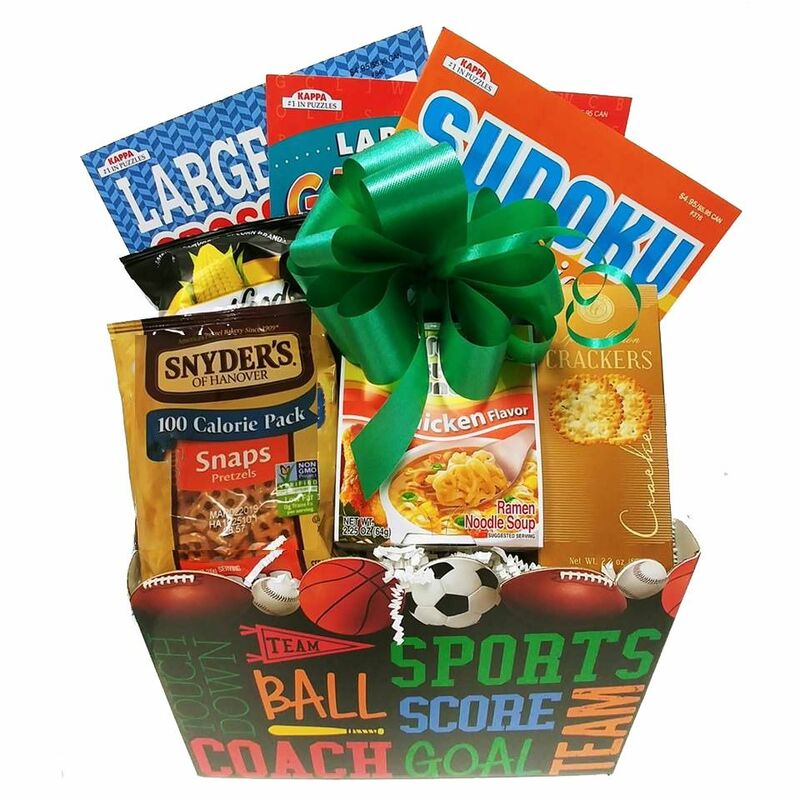 Show you care about their health and wellness with an entertaining gift basket of puzzle books.All Star Boredom Buster Gift Basket arrives fully assembled and ready to give in a sports themed gift box. It's wrapped in a clear cellophane bag and topped with a bow then bubble wrapped and shipped in a box to the recipient. Gift measures 10"l x 6"w x 12"h.
Delivered straight to their door enjoy the convenience and cost savings of free ground shipping. Don't forget to include your gift card message at check out. This fun gift basket makes a great gift for retirement, get well, or birthday. An entertaining gift for after surgery, recovery, and bed rest. Shipped nationwide.